This week we've got a couple of new ways for you to keep tab on how much you are holding in a looting bag or a trade window. We've also got a whole bunch of improvements for Great Kourend, including a big buff for blast mining and making it much more rewarding for reanimating creatures all over the map! 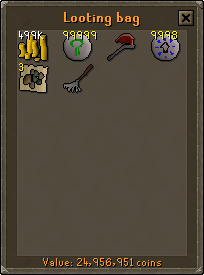 If you've been in the wilderness, stocking up on high value loot from the wilderness bosses or taking down other players, storing the loot in your looting bag, no more do you have to wonder exactly how much you are risking. Upon opening the looting bag interface you will now see a price check appear at the bottom letting you know the Grand Exchange value of everything you have stored! 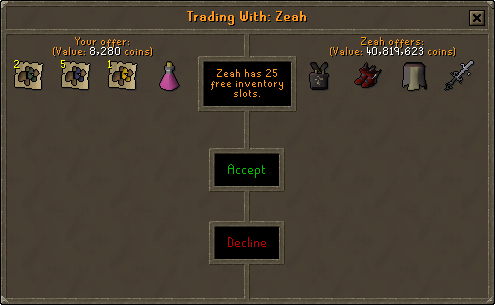 In addition to a price check on the looting bag, you will now be able to see the value of what you and the person you are trading have offered during trades! 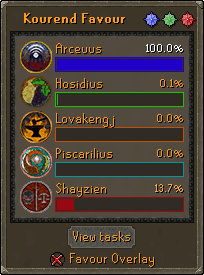 We have reworked the favour interface and have given it a new home. You can open the new favour interface by clicking the purple icon in the top right of the quest tab. From here you can also toggle whether or not you would like the original overlay to appear at the top of your screen and view the full task list using the 'View tasks' button. 48k xp per hour with 49k gp per hour. 58k xp per hour with 497k gp per hour. 64.4k xp per hour with 619k gp per hour. 69.8k xp per hour with 733k gp per hour. With this big improvement to the rewards we hope to see many more of you grabbing yourselves some dynamite and getting to work in the blast mine in the future! The prayer experience given for killing creatures reanimated using the necromancy spellbook has now been doubled and the 50% bonus when killing creatures by the dark altar has been removed. This should make necromancy more rewarding overall and will give you more opportunities to take advantage of it all over the Old School map. We have also added ensouled head drops for moss, ice and fire giants. We've made some slight improvements to the mapping of Great Kourend and you should notice a few small changes on your way around the city. Pets should now be much more reliable at following you out of an instanced area. You should no longer be stuck in the teleport animation after teleporting in to a crowded location. The Cooking skillcape perk now works when cooking chompy and jubbly meat. The bake pie spell can now be used to cook meat pies for the servery in the Hosidius house. You no longer need to have completed the Death Plateau quest to smith Shayzien supply armour (2). Cooking anglerfish on a fire now uses the correct animation. The rare trees icon near the Willow patch in Hosidius has been removed as Willow trees do not classify as a rare tree. A pair of shears on a table in the Hosidius house have moved slightly as they were inaccessible. Some stray blocking has been removed in a building of the Piscarilius house. The examine option for the Quest point hood has had a missing space added. A grammatical error in a game message relating to the Magic imbue spell has been corrected. Karambwan are now listed in the HP skill guide. A rogue apostrophe has been removed from dialogue in the 'Shadow of the storm' quest. Apple pies and Wines now correctly state that they are a free to play item in the HP skill guide. The quest journal for Underground pass has had a correction made when referring to searching the Soulless' cages. The examine message for Horned Graahks now has a space where one was missing. A typo has been fixed in dialogue from the 'Nature spirit' quest. The spelling of Taverley has been corrected from 'Taverly' in several places. The Wedge now correctly states that the elite Kandarin headgear offers unlimited teleports to Sherlock, not just 3. Inspecting the Harmony herb patch now gives a grammatically correct message. A typo in the 'Roving Elves' quest has been corrected. A typo in the 'Gertrude's Cat' quest has been corrected. The message received when your Varrock platebody allows you to smelt multiple bars at once has altered to be less misleading. The Mos Le'Harmless monkey's talk option now has more consistent capitilisation. A missing full stop has been added to the message stating to learn the spell from the Mage Training arena. A typo in the HP skill guide has been corrected. The shortcuts section of the Agility skill guide is now ordered correctly. Arceuus is now spelled correctly in the examine message on the Dark altar and the doors in the Arceuus area. A typo in the dialogue of the Arceuus pub has been corrected. The examine message of the soldier in the Shayzien area now correctly spells larva. The answer to the medium challenge scroll on Port Sarim asking how many ships are docked there has been updated to reflect Veos' ship. A typo in Aretha's dialogue has been corrected. A signpost on Zeah has had some directions corrected. The 'You're stunned!' message received when attempting to pickpocket is now filtered. The World Map has been updated. Why is there no world 39? Sorry for asking this here but is there any chances of us getting a F2P PvP World any time soon? Nice, everything looks good. Hopefully some of the spells for the necromancy spellbook passes as well so that it might be worth using aside from reanimating stuff.